Let your taste buds be amused and amazed with a chance for two people to dine in style at one of the hottest new restaurants in Dublin, Amuse on Dawson St. The team at Amuse have kindly given us a fantastic prize of a 5 course tasting menu for 2 people with matching wines. Amuse opened last July on Dublin’s Dawson Street and has received nothing but rave reviews from both diners and critics. Their style is simple. They’ve done away with the a la carte menu altogether. Amuse serve either a 5 or 7 course tasting menu, as well as a 2 or 3 course set menu. Their food is distinctly French, but with a lot of Asian influence. The menus may be small, but they showcase distinct flavours and are an undeniably creative. 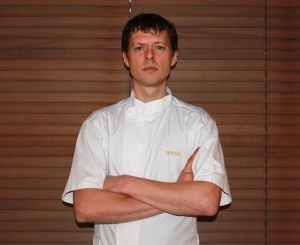 Conor Dempsey is the head chef and owner at Amuse Restaurant. Conor has worked in the industry since the age of sixteen. He has trained in some of the finest kitchens such as Marco Pierre White in the three-Michelin Star Oak Room for two years before moving to France where he worked in the three-star La Côte Saint Jacques in Burgundy. This was followed by a two-year stint in the two star Le Jules Verne in Paris. Conor then made the decision to return Dublin and was head chef in La Mere Zou for two years and head chef in Dax for seven years. He left Dax last April to open his stunning restaurant Amuse.